A recent article in The Washington Post posited that Americans are currently under-saved by $14 trillion or more for retirement. According to a 2014 Bloomberg report, all but six state pension plans are under-funded by 10% or more, 40 by 20% or more and 31 by 25% or more. Although many investors seem to have forgotten 2008, it was a mere seven years ago that the markets experienced their worst dip since the 1930s, with the S&P 500 losing 38.5% and the Dow dropping 33.8%. Despite a seven-year bull market, we should all do well to remember that poop can, does and will happen. It’s merely a question of when. Gender and investing is a sensitive subject. I have a lot of conversations with industry participants about why diversity is good for the financial industry and end investors, and why diverse managers, particularly women, exhibit strong outperformance. I think I’ve created some converts. I think others believe that I’m completely insane. However, I do believe that in order to overcome the tremendous financial hurdles that we face, we must think creatively about how to increase diversification, minimize bubbles and boost returns. At the end of the day, many financial professionals are trained to think about diversification in a number of straightforward dimensions. By Strategy – long-only versus hedged, diversifying strategies (managed futures/macro/market-neutral equity), etc. By Instrument – equities, bonds, commodities, real estate, etc. By Liquidity – liquid listed instruments versus OTC versus private investments, etc. But what we really don’t spend much time thinking about is diversification of behavior. Behavior is an inescapable reality of investing. What happens to your investments is undeniably impacted by behavior – yours, your broker, your money manager and macro-economic behavior - they all play a role in generating gains and losses. As a result, I believe it’s key to not only have a diversified portfolio of investments with different and diversifying strategies and instruments, it’s also important to have investment managers that will behave differently when approaching the markets. And that’s where women come in. Biology – Even though women are often stereotyped as “more emotional” when it comes to investing, that may not be the case. Brain structure and hormones impact how men and women interact with the markets, and can influence everything from probability weighting to risk taking to market bubbles. Overconfidence – There have been a number of studies that show men have a higher tendency to be overconfident investors. Overconfidence can manifest in a myriad of poor investment practices, including overconcentration in a single stock, not taking money off the table, riding a stock too far down (“It will come back to me”) and overtrading. Better trading hygiene – One very crucial side effect of overconfidence is overtrading. Overconfident investors tend to act (buy or sell) on more of their ideas, which can lead to overtrading. Over time, overtrading can significantly erode investment performance. Differentiated approach to risk – Although women are often stereotyped as being more “risk adverse,” the truth of the matter is a bit more nuanced. Men and women weigh probabilities differently, with women generally having a flatter probability weighting scale. This means they tend to not to inflate expected gains as much as their male counterparts, which can be beneficial in risk management and in minimizing overall market bubbles. Avoiding the herd – Women may be more likely to look at underfollowed companies, sectors, geographies or deal flow in order to obtain an investment edge. Maintaining conviction – Female investors may be better at differentiating market noise from bad investments. Women tend to be less likely to sell underperforming investments simply because of broad market declines. There have been a number of studies that showcase that these differentiated behaviors can really pay off. From studies by HFR, Eurekahedge, Vanguard, my work at Rothstein Kass (now KPMG), NYSSA, the University of California and other academic institutions, research suggests that women’s cognitive and behavioral investment traits are profitable. Alpha and additional diversification - how can that possibly be a bad thing? Now, before I become a complete pariah of the financial world, I’m not saying that investors should eschew male-managed funds for sole devotion to women-run funds. That would merely switch the behavioral risk from one pole to another. What I am suggesting is that if we are focused on minimizing risk and maximizing return, we should at least consider the idea that cognitive and behavioral alpha do exist and pursue them through allocations to women (and minority) fund managers. Of course, anyone who has spoken with me over the last, oh, two years, knows by now that I’ve been faithfully working on a book that addresses these very issues. 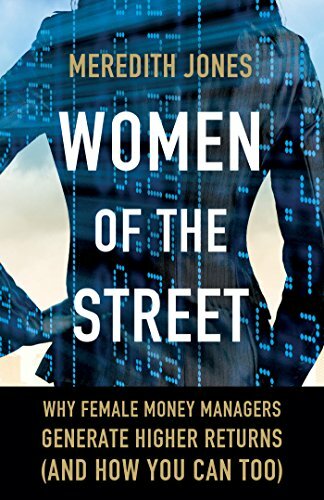 Today, after furious scribbling, interviewing, transcription, and maybe just a little swearing and throwing of my cell phone, Women of The Street: Why Female Money Managers Generate Higher Returns (and How You Can Too) was released by Palgrave Macmillan. Available on Amazon.com and other book retailers. To be honest, I kind of want to barf when I think about people reading my behavioral manifesto. But mostly I just hope that it makes us think about what we all stand to gain by looking not just for the next Warren, Julian, John or David, but also for the next Marjorie, Leah, Theresia and Olga. Sources: CNN Money, The Washington Post, Bloomberg, Women of The Street: Why Female Money Managers Generate Higher Returns (and How You Can Too).